That’s really funny. But it would be great! More uhh… national pride for the Philippines? Haha. That’s the wonder of SEO in the Philippines. BTW, congratulations to you Ms. Nina. Hope you can make more pages rank oddly in other search terms. Tiffany: Haha, onga eh. Does that mean ba Pinoys have more national pride? Gosh! Ferdz: Oh di ba? 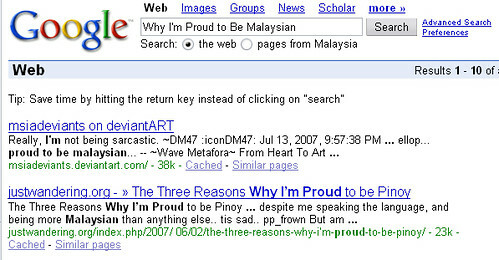 First na rin ako sa “why I’m proud to be Pinoy.” Yay! OMG. I’m the culprit! Tis so bizarre..